A businessman is distraught after refusing to follow the instructions of his wife's kidnapper. The film is a unique social comedy based in a small town of Uttar Pradesh directed by Hansal Mehta. It stars Rajkummar Rao and Nushrat Bharucha. It is co-produced by Ajay Devgn, Luv Ranjan and Ankur Garg. Deepak Singh is a farmer in Rajasthan. After a tragedy, he migrates to Mumbai with his wife and child to lead a better life. However, upon arriving, he soon discovers the challenges of life in a big city. I saw this movie only because it was a White Feather Production whose previous film Dus Kahaneeyain was a good film(considering all ten stories). It's coming up with new ideas which have never been applied in Bollywood, plus 'The Great Indian Butterfly' and 'Pankh' also look very good in the trailers. 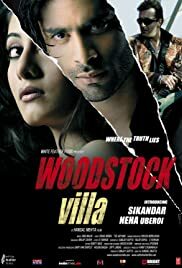 But this film was really a disappointment, the new actor Sikander Kher, son of Anupam Kher really dint act well nor did any one else and even the soundtrack is pathetic. The only reason that one can sit through the film is because it's not slow and second that the storyline is not all that bad, mildly predictable but bearable.